I first noticed the slightly faded sky-blue billboard while driving into Alamogordo, New Mexico decades ago. The sign had a yellow moon and stars with the words “Dream Homes” in bold lettering across the expanse of the panel. Directly below the large billboard was a dirt filled lot with the ruins of mobile homes, the doors and windows long gone. Even the layers of spray paint appeared faded. Over the decades I have watched for this advertisement as I pass between Tularosa and Alamogordo. Eventually the houses were removed, but the sign remained, bleaching slowly under the bright New Mexican sun. Finally, on my most recent visit, the billboard was simply a white rectangle hovering above the dirt and mesquite which now occupy the land. The poetry of the words and the broken houses have faded into oblivion, but it is just these all too familiar types of barren monuments which inspire the work for “Square States and Moonscapes,” by Laramie based artist Patrick Kikut. Kikut’s work brings our attention to those forgotten places; to the remnants of abandoned dreams, to the things we leave behind. Kikut is a Westerner through and through; raised in California he has lived across the region and currently travels between homes in Santa Fe and Laramie where he teaches at the University of Wyoming. Those of us who call the West home for any length of time become familiar with the long stretches of road that connect our communities. Traveling these roads we may idly cast an eye at a dilapidated homestead or a run-down sign advertising a long forgotten business. Kikut is drawn to these in-between spaces where dreams were abandoned and only debris remains. While the forgotten human elements are the central figures of his work, it is the landscape that is both familiar and foreign at the same moment. Kikut emphasizes the strange and open in-between spaces of the West; in his paintings we see recognizable vast and empty landscapes. One wonders what bold person ever thought that they could sustain a life or enterprise in this harsh and desolate land. 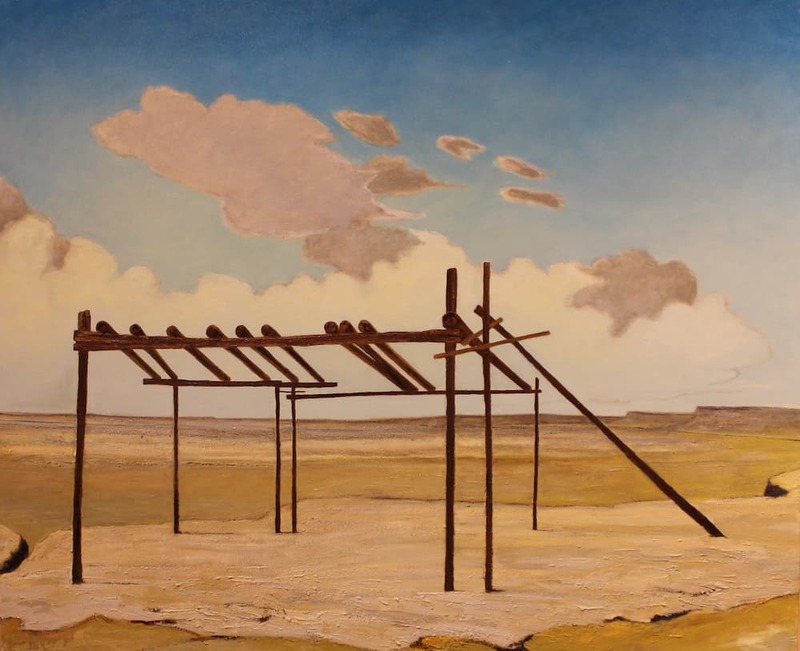 In his piece “Scenic Overview-South Dakota” Kikut has painted twenty-two logs — all that remains of a forgotten structure. Behind the edifice the land recedes into distant plateaus. The earth looks unforgivingly harsh and undeniably lunar, yet it also looks like a place any Westerner has driven past hundreds of times. 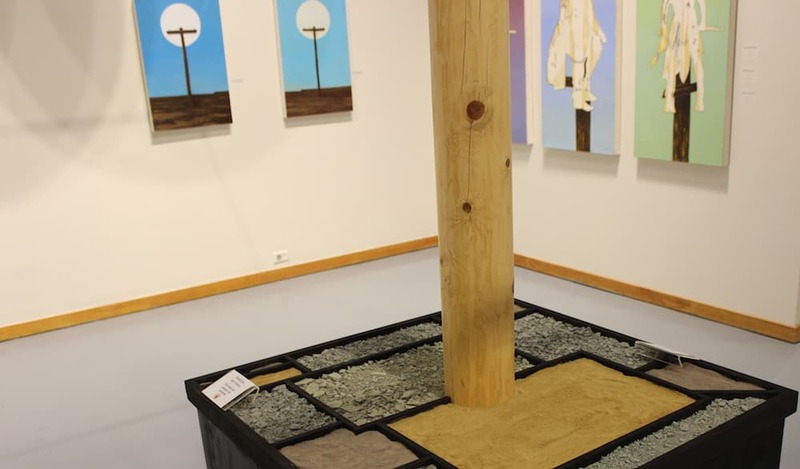 Walking into “Square States and Moonscapes” in the Nicolaysen Art Museum’s Ptasynski Gallery, a visitor cannot miss “Telephone Pole and Full Moon.” The large three-dimensional work demands immediate attention. Atop a large black box a wooden post reaches toward the ceiling. Following the post upward we see a telephone pole with glowing fluorescent wires. Behind the telephone pole hangs a full white moon. The reverse side of the moon reveals a vibrant yellow sun, a nod to the solar eclipse on Aug. 21. A closer look reveals that the base of the pole is set on top of a map of the Western states that Kikut depicts within this body of work. Filling this map are various colored soils from each state. The front and back walls of the gallery space have several paintings featuring the moon, bright and white. Among the lunar paintings are a series of vertically hung rectangular works in which a telephone pole stands in front of the full moon. Behind this familiar scene there are varying shades of blue; the celestial bodies appearing almost as faded silhouettes against luminous skies. Similarly, in the white and worn series of kachina billboards, painted against vibrantly hued atmospheres, we are again reminded of the moon. The signs are weathered and pockmarked, much like alien landscapes. Kachinas can be understood as ancestral spirits in both Pueblo and Hopi cultures. In the exhibit catalog, Kikut refers to the kachinas by saying, “I am including them to add a human presence, and I hope they will read like a kind of connector from land to sky.” Kikut has paired the figures with the transient nature of a billboard, drawing us into a conversation about ownership, culture, and our relationship with the land. To fully appreciate the art of Patrick Kikut we may need to look at his work through two different lenses. Through one lens we see remnants of the past and that which we once deemed important enough to build or to advertise; we see the things we leave behind, forgotten and fading. Through the other lens we can see the vast Western landscape for what it is; a part of a planet, a place where humans can only bear witness to an ongoing conversation between earth and moon. It is only then that we can begin to appreciate the transient beauty Kikut asks us to stop and notice. “Square States and Moonscapes” will be on display through September 24, 2017 at the Nicolaysen Art Museum in Casper. Visitors can pick up an exhibition catalog with entry into the exhibit. The catalog includes images of the work, a foreword by curator Eric K. Wimmer, an interview between Gordon McConnel and Patrick Kikut, and an essay by William L. Fox. Maria Rose Wimmer was born in Montana and has worked and lived throughout the West. She began formal art training at age 13. In 1999 she attended college at Eastern New Mexico University on the Lorraine Schula Scholarship for Art. Maria Rose later received a BA from the University of Montana and her Master’s Degree in Art History from the University of Denver. She moved to Casper, Wyoming in 2009 and since then her work has been seen locally at the Corridor Gallery, Scarlow’s Gallery, the Goodstein Gallery and The Nicolaysen Art Museum as well as nationally. Maria Rose has work in private collections throughout North America, Europe and Australia including Sydney, Portland, Denver, Chicago and Los Angeles.